For the longest time, Tron was somewhat of a white whale for me. Apart from fleeting footage on TV here and there, I’d only heard and read about it several times in my childhood, having only gotten a very rudimentary understanding that it was some kind of old Disney film set in a computer. References to the movie seemed to pop up everywhere, though, from video games to that one Halloween episode of The Simpsons where Homer crosses over into a computer generated 3D world, and I’d always be reminded of that one Disney film set inside a computer that everyone seemed to have seen, including my own mom, who had seen it back when she was in high school and who mentioned it more often than probably anyone else in my life. I never was able to get a hold of a copy, however. It never seemed to turn up in rental stores on VHS or DVD (and LaserDisc was something my family never adopted), and not even cable TV seemed to turn up any airings. It wasn’t until the release of the 20th anniversary DVD in 2002 that I was provided with an opportunity to finally watch it, thanks to my fellow nerd and friend loving the film enough to actually get the 2-disc set. While I don’t recall exactly when we actually got around to watching it, I do remember the emotion that ran through me upon getting to the middle part of the movie: Complete and utter boredom. Suddenly that joke from The Simpsons, in which all the characters but Homer dismissively inform him that they’ve never seen the film, took on a whole other layer for me. It wasn’t that this was just a long forgotten film. This was a long forgotten film that probably deserved to be long forgotten. 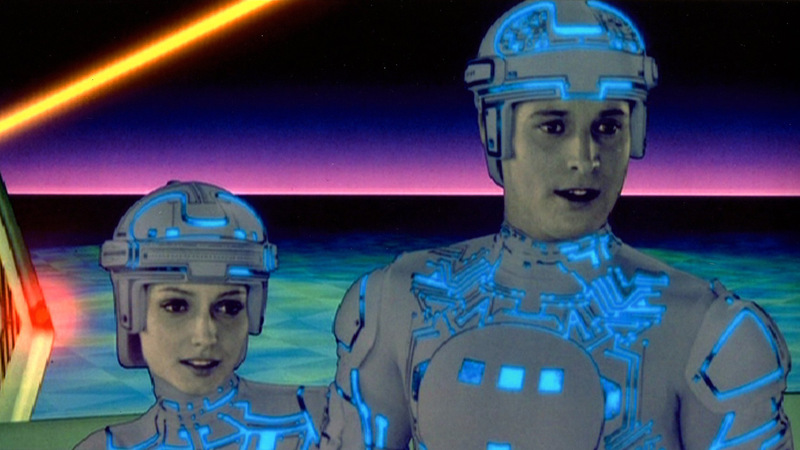 To say that finally getting to watch Tron was a disappointing, empty experience for my high school self, despite the earlier warnings I’d had, would be an understatement. I admit that there was probably a part of me that couldn’t believe that my best friend would also find such a film so fascinating was almost incomprehensible to me. I’m not saying that I considered de-friending him, but I certainly was starting to have flashbacks to that time when I overheard him and his other friend (who, in retrospect, did admittedly do most of the talking) lamenting that they didn’t have Klingon power to intimidate the school into getting out of PE. Sure, the movie looked interesting, but, good grief, was the plot ever boring. The core of the story revolves around a large company called ENCOM, which seems to produce software in a wide variety of fields, including, most notably in this film, the latest craze in entertainment: video games. One of their top designers, Kevin Flynn, however, quit when his games were stolen by a man named Ed Dillinger, who took the credit and rose to the top. To be honest, though, this seems kind of pointless, as Dillinger is obviously a talented programmer in his own right, having been the one responsible for providing the company’s security system, the Master Control Program, with a human level of intelligence and ambition – not to mention a taste for supervillainy. So when Lora and Alan, friends of Flynn’s who still work at ENCOM, sneak him back into the facility to reclaim his work, Flynn finds himself a target of Dillinger and the MCP, which activates a laser beam that digitizes his physical form and transports him to the digital world where the MCP rules over all the other programs and subjects them to gladiatorial games of death – games that bear a resemblance to the ones Dillinger stole from Flynn. And so Flynn finds himself going up against the MCP and his lieutenant Sark, teaming up along the way with a security program named Tron, who was created by Alan to keep tabs on the increasingly suspect MCP. It’s an interesting concept with a lot of cool ideas behind it. Programs like Tron and Sark are made in their creators’ likeness, creating a religious overtone to the story that also sees the MCP as a rebellious Lucifer figure who would like nothing more than for the isolated programs to disbelieve in the existence of creators he knows actually exist on the other side. Naturally, Flynn thus takes on a sort of Christ-like savior role, a “user” who is brought into the program world looking like them and leading them into victory against their evil oppressor. The film also has a look all its own, with the computerized worlds borrowing from the video game graphics and sound effects of the era, particularly in the way that the world’s geography and vehicles are rendered mostly with vector graphics. The film was also a pioneer in computer effects, blending live action, traditional, and CGI animation fairly seamlessly for one of the first times in the history of cinema – a technique that was so new at the time, they were actually snubbed for the effects Oscar for “cheating.” Yeah, considering the fact that no movie these days can basically be nominated in the category without having most of its effects be virtual rather than physical, that’s pretty astounding to think about. The film definitely deserved at least a nomination, you know? Its uniqueness also extends to the film’s electronic soundtrack, composed by Wendy Carlos. It’s playful and yet completely foreign, and while electronic elements in a score were hardly a first for the time – Chariots of Fire was released the year prior and its anachronistic score earned the film the Academy Award for Best Original Score – Tron’s score sets itself apart from even that by rarely resembling anything close to your traditional classical orchestra sound. Nope. Again, I was bored out of my mind and couldn’t concentrate on what was happening. By this point, I had gotten more into film itself and was earnestly trying to push my limits as far as what I watched, and I was reading more and more about these kinds of cult films and reading forums and comments from fans online. “Dammit,” I thought, “I will watch this movie until I finally understand what is that clicks with all these people!” And so I watched it again. Nope. Still nothing. And, after some time, again. Then I was able to drink alcohol. Would that help? Again… nope. I guess it was just that I finally got the significance of this 28-year-old film getting a sequel that generated so much genuine excitement from both fans of the original and newcomers who possibly had no idea that it was even a sequel. Legacy … heck, pretty much all of the films that are hyped up these days couldn’t possibly have existed without films like Tron, films that were willing to push the boundaries of what technology could bring us, budgets be damned. It’s not unlike two other films put out by Disney, Snow White and the Seven Dwarfs, the first ever feature length animated movie, and Toy Story, the first ever feature length computer animated film. Neither of those movies are arguably the best in their fields anymore (though both certainly are very good movies in their own right and can be appreciated by a wider audience than the much more niche Tron). Snow White is as basic and plain as the Disney Princess films get, starring a heroine whose personality is only out done in basicness by Aurora in Sleeping Beauty some years later. Toy Story, though still a fantastic story, has itself spawned a billion copycats in a format that now largely dominates the animated medium, some of which tell stories just as compelling, than the one that started it all, but almost always showing improvements in the techniques used to create those stories’ worlds and characters, making the early work seem almost deficient without the contemporary perspective. 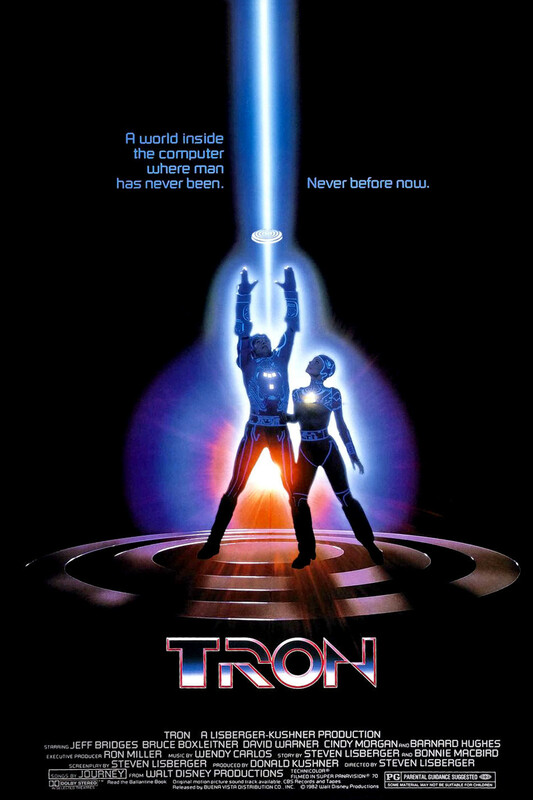 Both of these films are dated by today’s standards in one way or another, but even then, if you don’t care for anything else, they can be appreciated and marveled at on a purely technical standpoint for the incredible things they accomplished early on, and the same can arguably be said for Tron, too. Yes, its story is slow and often vague to a fault, but, at the very least, its characters and the actors playing them are just endearing enough that it’s certainly possible to sit back, relax, and take in all the work that went into realizing the world they inhabit and, meanwhile, checking in mentally now and then to see what destination they may be taking us towards next. 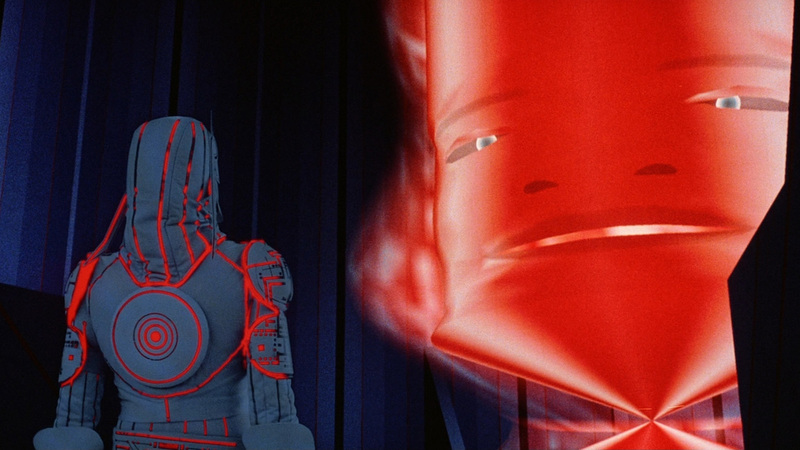 Even the technically superior sequel – which arguably evolves the Tron look so much towards a more textured, lifelike world that it’s actually a little more generic as a result – was able to duplicate the uniqueness of what was produced here, and no other film has since been able to top it for iconic designs. Watching Tron is admittedly not a particularly exciting journey, but that’s okay – sometimes a leisurely stroll through strange new worlds and meeting new characters can be a refreshing change of pace from the hurried rush found in your typical sci-fi films. Update! You know, not that anyone was really worried… REVIEW: Super Mario Bros.